That means it’s time for tailgating, appetizers, snacky, man-food type stuff. It’s also casserole season. There is a slight chill to the air, and a warm casserole just seems to hit the spot. 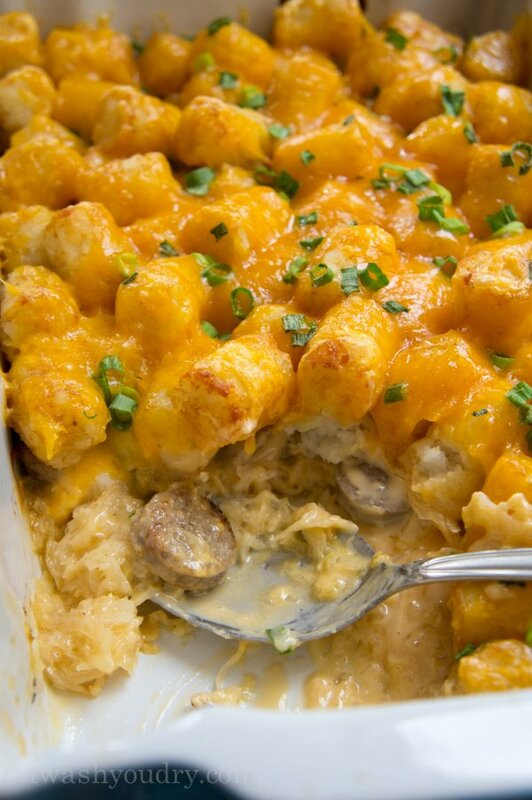 This cheesy Tater Tot and Bratwurst Casserole tackles both the hungry-man-food problem, and the warm-up-your-belly situation. 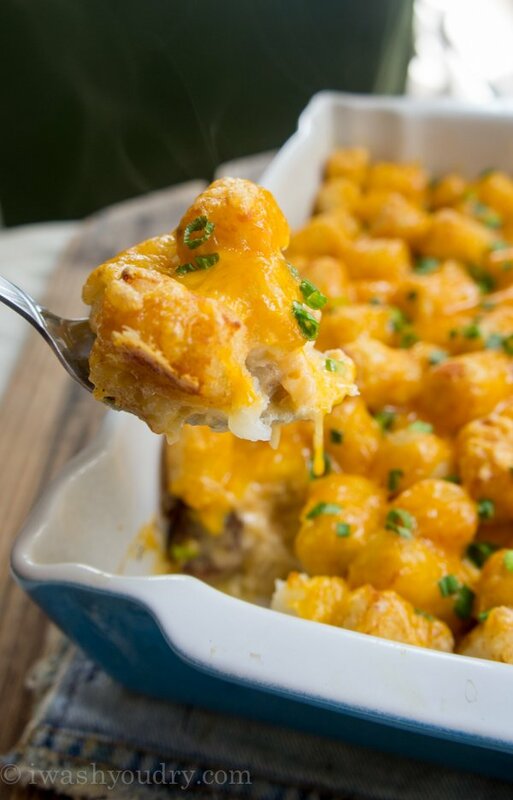 It’s the combination of sauerkraut, bratwurst, and crispy tater tots fused together with a creamy cheese sauce, then piled high with more melted cheese on top. It’s incredibly easy to throw this crowd pleasing meal together! Just looking at these pictures is making me want to kick my feet up, grab a big helping of this casserole, and re-live each delicious bite. The tang of the sauerkraut is tamed down by the cheese sauce, and not over powering at all. The bratwurst gives it a savory kick, while the crispy tater tots on top lend to your prepubescent cravings. 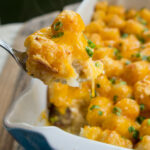 This tater tot and bratwurst casserole was a touchdown with my family. 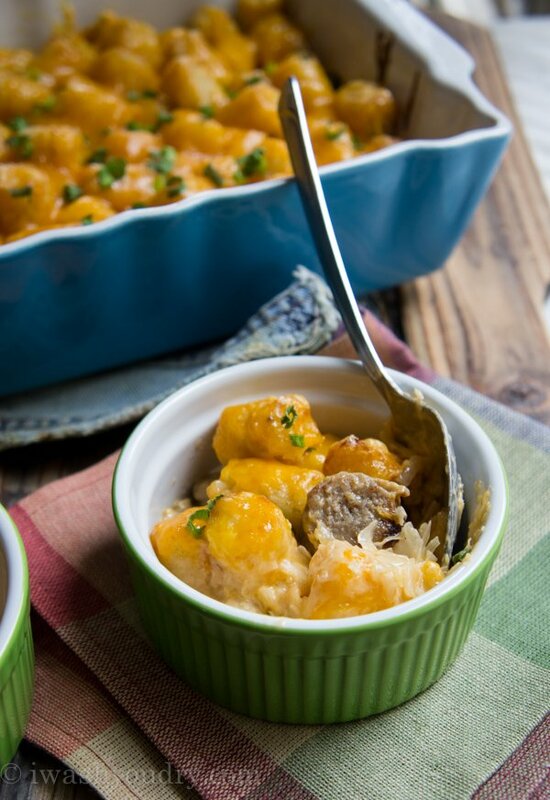 Tater Tot and Bratwurst Casserole is the combination of sauerkraut, bratwurst, and crispy tater tots fused together with a creamy cheese sauce, then piled high with more melted cheese on top. In a large saucepan combine the chicken broth and bratwursts, bring to a boil. Reduce heat, cover, and simmer for 10-12 minutes, or until the bratwursts are cooked through. Drain and discard chicken broth. Place brats on a cutting board and cut into 1/4 inch pieces. Place the saucepan back on the stove and brown the bratwursts in the butter over medium-high heat. Drain on paper towels. Spoon the drained sauerkraut into a greased 9×13″ casserole dish. Top with the bratwursts. In a bowl, whisk together the cheddar cheese soup and milk until smooth. Pour over the brats. 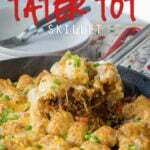 Top with the tater tots. Bake for 20-25 minutes or until the potatoes are lightly browned and crisp. Sprinkle with the cheese and onions, bake for an additional 5 minutes or until the cheese is melted. Enjoy! Absolutely fantastic recipe! I dont suppose anyone knows the calories per serving for this recipe? Is the oven temp correct @ 450?? Yup! You want it at a higher heat for the tater tots to get nice and crispy! I can’t get over all the folks that want to substitute the Sauerkraut or say that they hate it. I think that most people don’t realize , that you are supposed to rinse the Sauerkraut that you buy in the can or bag ,at least once before you use it. Did not have cheddar soup so used queso dip and sour cream 50/50. Also used hash browns in lieu of tots. Still delicious! My kids rrally do not like saur kraut. Is there anything I can use as a substitute. I’m excited to try it! Sounds delicious! This casserole is amazing! I have made it probably 10 times since I found this recipe and I can’t get enough! 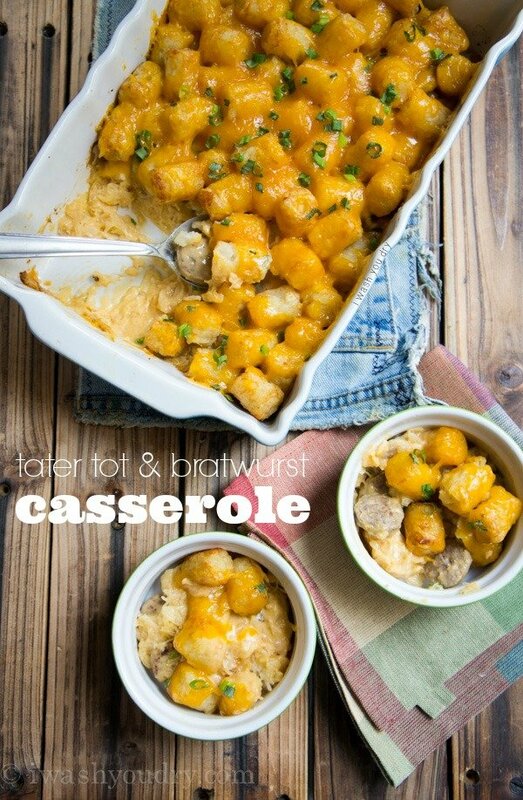 Every time I find bratwurst on sale THIS casserole comes to mind. Love it! Use beer to boil a good brat! Implants on making this for Oktoberfest party! We just ate this for dinner – DELISH. I subbed farmer bologna for the brats and boiled it in beer. Next time, I’m going to double the kraut, since I love kraut. I just made this and it is SO GOOD. Thank you thank you! My husband hasn’t tried it yet but I know he’s going to love it. Whoa I never would’ve guessed to make this! 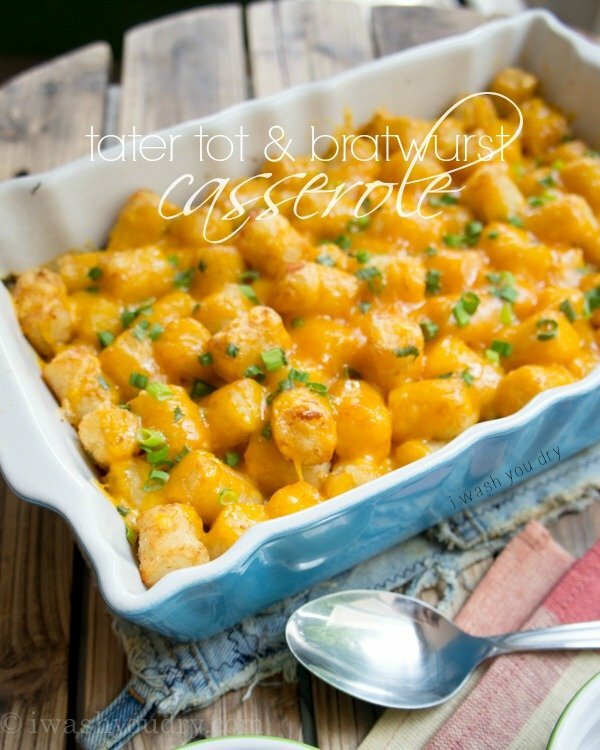 I LOVE tater tots, and this looks so comforting. Is there anything I can use in place of sauerkraut? The entire family doesn’t like it, including myself. Maybe just leave it out? Yeah- I was going to just leave it out as well. It should still be totally delish! This looks so good – what a great twist on a classic! What a glorious casserole! Tater tots are my absolute favorite! 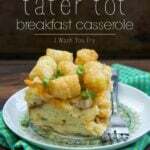 Such a fun and delicious twist to the tatertot casserole! This is so genius! 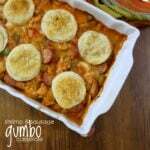 I love this idea…do you think andouille sausage would work in this as well? I really only like two kinds of sausage which is breakfast type sausage and andouille… But cheese and tater tots….I’m there! Definitely! If you get an andouille sausage that is already cooked then just skip the boiling part, and brown it in the butter before putting it in the casserole dish. 🙂 Thanks Dana!